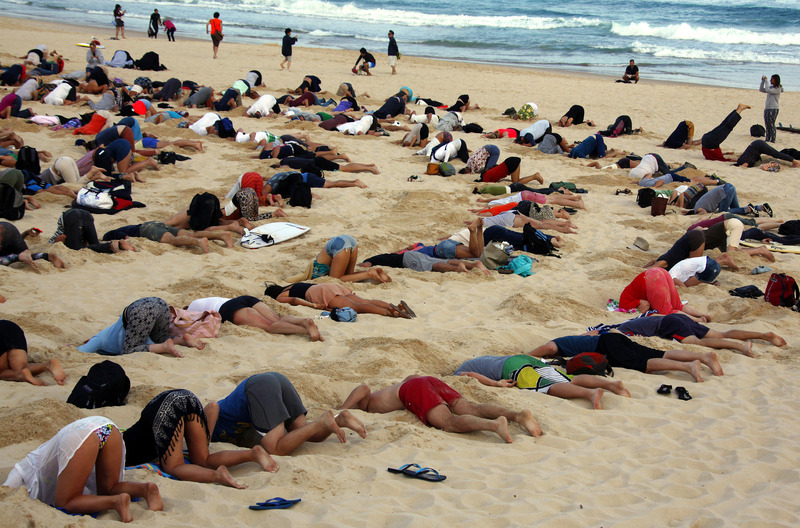 A group of 400 demonstrators gathered on Sydney, Australia's famous Bondi Beach on Thursday and buried their heads in the sand, aiming to highlight Prime Minister Tony Abbott's refusal to include the topic of climate change on the agenda of the upcoming G20 summit. "Obama's on board, Xi Jinping's on board, everyone's on board except one man," activist Pat Norman, 28, said into a megaphone, according to Reuters. Climate change demonstrators send Australian Prime Minister Tony Abbott a message ahead of the G20 economic summit, which will take place in Queensland. World leaders are gathering November 15-16 in Brisbane, the capital city of Queensland, Australia, for the annual G20 summit. Australia currently holds the presidency of the group of the world's leading economies and sets annual priorities. In 2009 Abbott called climate change science "crap" and said this past October that "coal is good for humanity," while opening a coal mine in Queensland. In July, the Australian Senate voted to repeal a two-year old tax on carbon emissions, becoming the first developed nation to reverse such a policy. Abbott pledged to prioritize economic growth over addressing climate change while campaigning for Prime Minister. He made repeal of the tax a central part of his platform. Abbott has called for reducing the amount of energy Australia will generate from renewable sources. In 2010, the government set a target of generating 41,000 gigawatt hours — about 20% of demand — of renewable energy by 2020. But Abbott has proposed to scale back the mandate to 27,000 gigawatts. Australia is the world's 12th largest economy and has one of the highest per capita levels of fossil fuel emissions among developed nations. For the past several years, Australia has been hit annually by extreme wildfires, heat waves, and flooding that scientists say are becoming more severe and occurring more frequently because of climate change. And scientists warn that ocean acidification — caused by elevated levels of carbon dioxide in the sea — presents the most significant threat to the future of the Great Barrier Reef. "With world leaders arriving for the G20 Summit in Brisbane," Eden Tehan, of 350.org Australia, said in a statement, "a heads in the sand event seemed a great way to let the world know that most Australian's don't agree with our Government's inaction and think we should join the global effort reduce emissions, stop new fossil fuel projects and ramp up renewable energy.